ACURAFLEX is the strongest and most effective set of natural anti-inflammatory cream and capsules for treating arthritis and sciatica, as well as pain in joint and muscles. 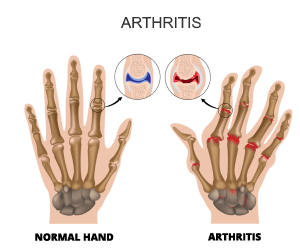 Arthritis is a common name for the variety of inflammatory processes of the joints, leading to the loss of joint cartilage. Arthritis is not just a single condition but rather a set of as many as 100 different conditions that cause pain and restrict your mobility. The more frequent the pain is, the more likely it’s caused by osteoarthritis and rheumatoid arthritis. The causes of arthritis are still unknown but are usually linked to genetic predispositions and viral or bacterial infections. It can develop gradually and progressively. Most commonly it occurs among older people, but due to the increasing trend of “sedentary” lifestyle, it can also occur among younger and middle-aged people. Arthritis is more common among women than among men. Accumulation of water in the knee area. Treatment of rheumatic diseases, including arthritis, is aimed at reducing pain and inflammation, preventing further damage to bones and ligaments in joints, as well as increasing joint movement and mobility. For treating Arthritis, doctors usually prescribe drugs like corticosteroids. In most cases, they are successful in reducing inflammation, but also in slowing down further joint damage. But, corticosteroids can usually only improve health conditions of the patients in short run, while losing the effectiveness in long-term use, and on top of that, they are known for causing serious side effects. Because of the serious consequences and side effects of these long-term medications, more and more people are turning to Acuraflex – a combination of natural cream and capsules. Rheumatoid arthritis is a chronic inflammatory disorder which, besides the joints, cartilage and bones, can also negatively affect the skin, lungs, eyes, the heart, and the blood vessels. The process begins with the synovium, the membranes that support the joints and feed the cartilage, and eventually leads to the gradual destruction of the bone itself. In progressive rheumatoid arthritis, cartilage destruction is accelerated when the fluid and inflammatory cells accumulate in the synovium, forming a growth (panus), which is composed of thickened synovial tissue. Panus produces more enzymes which destroy the nearby cartilage, worsening the status of the affected area and attracting more inflammatory cells, causing the inflammatory process to reoccur. Fatigue, increased body temperature, and uncontrolled weight loss. Early rheumatoid arthritis most often affects the smaller joints, especially those on fingers and feet. As the disease progresses, the symptoms often spread to the other joints, knees, ankles, elbows, hips, and shoulders. In most cases, the symptoms appear in the same joints on both sides of the body. About 40 percent of people with rheumatoid arthritis also have signs and symptoms that do not involve joints. Rheumatoid arthritis can affect many other unrelated structures, including skin, lungs, heart, kidneys, salivary glands, nerve tissue. Signs and symptoms of rheumatoid arthritis may vary in strength and may occur sporadically and disappear. Over the time, rheumatoid arthritis can cause deformations and move joints out of place. There is no cure for rheumatoid arthritis. There are pharmaceutical or natural remedies that relieve the symptoms, prevent further spread of the disease or act preventively. Both doctors and patients generally lean toward the combined use of pharmaceutical and natural medicines at the same time. Usually, pharmaceutical drugs are taken for the short period of time because they can cause side effects and may in the long term be harmful to the body, while the natural remedies such as Acuraflex cream and capsules are taken in the long-term, or combined, because they do not cause side effects. Doctors prescribe pharmacotherapy depending on the stage of the condition, the severity of the symptoms, the time required (short-term or long-term), and if the patient is already taking any other medications that should not be mixed with rheumatoid arthritis medications. Anti-rheumatic drugs which modify the condition and can slow the progression of rheumatoid arthritis, save the joints, and other permanent tissue damage (most common side effects vary, but may include liver damage, bone marrow suppression, and severe lung infection). Doctors prescribe natural medicines such as Acuraflex for mild symptoms or early stages of rheumatoid arthritis, and in medium and severe cases as a supplement to regular pharmaceutical therapy. Depending on the stage of the condition and how severe the symptoms are, If possible, it’s always a good idea to use only natural medicine because they are beneficial to the organism and have a wide range of positive effects on all organs and body parts. > Learn more about effects and natural ingredients of Acuraflex. How Can Acuraflex Help With Rheumatoid Arthritis? Acuraflex capsules contain Glucosamine sulfate and chondroitin sulfate, both of which reduce the progression of rheumatoid arthritis by contributing to the slowing down loss of cartilage and its deterioration. Using chondroitin sulfate increases the mobility of degenerated joints, reduces the pain and the need for the use of nonsteroidal and anti-inflammatory drugs. Curcumin works on inflammatory processes in the body, reduces or even eliminates symptoms such as morning stiffness, prolongs mobility periods, and reduces swelling of the joints. Acuraflex products do not cause any side effects and can be used in combination with any medication. Acuraflex cream works anti-inflammatory and quickly relieves pain. It’s easily absorbed over skin and its carefully selected natural healing ingredients with anti-inflammatory and nourishing properties will bring you an immediate relief. Acuraflex cream contains many quality, effective and safe ingredients such as essential oils and extracts obtained from curcumin, aloe vera, camphor, eucalyptus, ginger, apricot pepper, menthol, wintergreen, almond, jojoba, rapeseed, acacia and vitamin E.
Acuraflex cream is currently the only product on the market whose formula contains such a large number of active natural ingredients. Osteoarthritis makes almost half of all types of arthritis, and it is characterized by the destruction of the joint cartilage. Other names for osteoarthritis are degenerative arthritis, degenerative joint disease, or arthrosis. Body parts most commonly affected by osteoarthritis are fingers, spine, hips, knees, and feet. In the majority of cases, it affects middle-aged or older people, while women are more likely to suffer from it than men. Re-occurring acute pain if the affected joint is too often used. There is no cure for osteoarthritis. There are pharmaceutical or natural remedies that relieve the symptoms, prevent further spread of the condition or act preventively. Both doctors and patients generally lean toward the combined use of pharmaceuticals and natural medicines at the same time. Usually, pharmaceuticals are taken in the short-term because they can cause side effects, and in the long run, they may be harmful to the body, while natural medicines are taken for a prolonged period of time, or combined, because they do not cause any side effects. Doctors prescribe pharmacotherapy depending on the stage of the condition, the severity of the symptoms, the time required (short-term or long-term), and if the patient is already taking any other medications that should not be mixed with other medications for osteoarthritis. Doctors prescribe natural medicines such as Acuraflex for mild symptoms or early stages of osteoarthritis, and in medium and severe cases as a supplement to regular pharmaceutical therapy. Depending on the stage of the condition and how severe the symptoms are, If possible it’s always a good idea to use only natural medicine because they are beneficial to the organism and have a wide range of positive effects on all organs and body parts. > Learn more about effects and natural ingredients of Acuraflex. 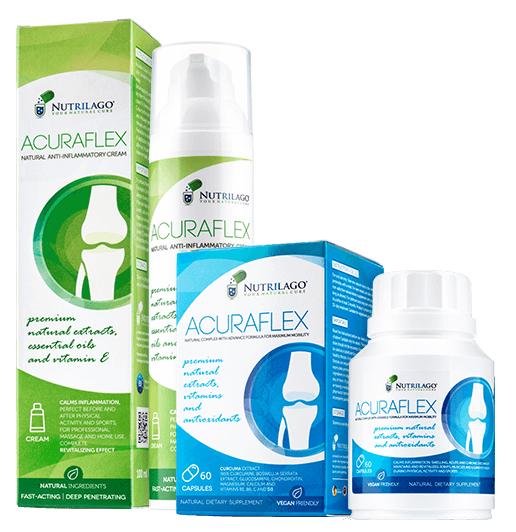 How Can Acuraflex Help With Osteoarthritis? The combination of ingredients of Acuraflex capsules and cream has an analgesic effect and alleviates or completely eliminates pain, reduces swelling in the joints, removes or alleviates morning stiffness, eliminating the feeling of weakness in the legs. Among other things, they increase joint flexibility within a month, strengthen joints and tendons by 45%, and affect the inflamed areas of the body caused by osteoarthritis within the first two weeks of use. Glucosamine sulfate and chondroitin sulfate in capsules reduce the progression of osteoarthritis by slowing down the process of loss and wear of cartilage, while curcumin (turmeric) is reducing inflammatory processes in the body. They do not cause side effects and can be used in combination with any other medication. Sciatica is a term that describes the painful condition that arises due to pressure on the root of the large nerve that emerges from the spinal cord – nervus ischiadicus. When a person is suffering from sciatica, he or she feels a flushing pain that goes from the lower back, through the buttocks to the thighs, and through the lower leg can be extended to the foot. Nervus ischiadicus is the longest and the thickest nerve in the entire body. It is composed out of five smaller nerves coming out of the lumbosacral part of the spine and slides down the legs, where it branches in smaller nerves connecting the knee area, limbs, feet, and fingers. Sciatica is not a medical diagnosis in itself – it is a symptom of the general health condition. Usually, the triggers for sciatica among patients are some of the problems that occur in the lower back. Spinal disc herniation – disk protrusion and disk prolapse. Sciatica is most commonly caused by the herniated disk of the lumbar spine. Degenerative disorders of the disk – are the result of microtrauma and body load. This phenomenon cannot be prevented, but with the proper lifestyle, the degenerative changes can be slowed down. Spondylolysis – the frontal displacement of the upper to the lower vertebrae, most commonly is occurring at the 4th and 5th lumbar vertebrae levels, or the 5th lumbar spine and the 1st sacral vertebrae. It can cause severe pain. Stenosis of the spinal canal – degenerative spinal cord disease resulting in the narrowing of the spinal canal through which the spinal cord and the roots of the nerves pass. Symptoms of stenosis of the spinal canal arise due to the degenerated disk and the pressure on the root nerve. The most common symptoms are pain in one or both legs, leg deformity, lump, loss of foot sensation, loss of urination and stool control, and weakness in the legs and pain in the back. Unfortunately, the syndrome symptoms are often painful and very severe. When the symptoms of sciatica are so intense, it is often very difficult for a patient to find a position where he or she does not feel pain, since almost all body activities are hurtful. Pain occurs when sitting and laying, as well as standing and walking. There is no cure for sciatica. There are pharmaceutical or natural remedies that relieve the symptoms, or act preventively. Both doctors and patients generally lean toward the combined use of pharmaceuticals and natural medicines at the same time. Usually, pharmaceuticals are taken in the short-term because they can cause side effects, and in the long run, they may be harmful to the body, while natural medicines are taken for a prolonged period of time, or combined, because they do not cause any side effects. Doctors prescribe pharmacotherapy depending on the stage of condition, the severity of the symptoms, the time required (short-term or long-term), and if the patient is already taking any other medications that should not be mixed with other pain-killers. Exercise, stretching, activity and physical therapy. How Can Acuraflex Help With Sciatica? Acuralflex capsules contain a curcumin extract, known for its strong anti-inflammatory effects, and it’s comparable to both prescribed and purchased anti-inflammatory drugs. They also contain ginger extract and Indian tamian gum extract, both with widely known anti-inflammatory properties. They contain calcium and magnesium as well as vitamins B1 and B6, all important for normal functioning of the nervous system and muscles. Acuraflex cream contains high-quality oils, vitamin E, aloe vera, cayenne pepper, mint whose analgesic properties provide instant relief when applied on a painful spot while nourishing the skin at the same time. It also contains herbal ingredients such as curcumin, ginger, aloe vera and other anti-inflammatory agents. Both capsules and cream do not cause any side effects and can be combined with other medicines. Acuraflex cream is currently the only product on the market whose formula contains such a large number of active natural ingredients. > Check price and order your Acuraflex cream and capsules here.